When we think of tournament angling, most of us think of bass fishing, and the sight of bass boats loaded with 20 or 30 rods and reel combinations for every technique possible. Not many think of tournament angling for musky, and the set up for musky fishing is a lot different than what we may perceive. 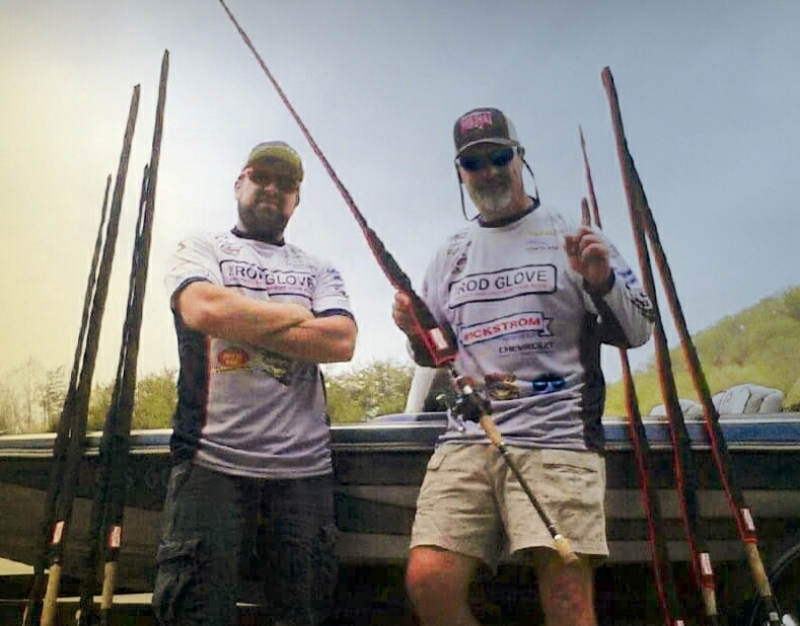 The Rod Glove offers the Big Stick Series of Rod Gloves aimed at musky fishermen and we are proud to have both Nick Filip and Aaron Laking as part of our Pro Staff team. Nick learnt his fishing skills from his Father who was an avid fisherman and sold his bass lures that he handcrafted at local craft shows. While fishing most of his time for bass, and walleye it wasn't until he went on a family vacation with his neighbour that he got introduced to musky fishing and his first musky. He was instantly addicted to the thrill of catching the musky and the fight to bring the large fish into the boat. Having no boat of his own, he went to Facebook and met with Aaron, who is now his team mate and angler. Nick's advice to the next generation of anglers is to be patient, methodical and to never leave fish to find fish. Aaron's fishing background is quite different as he spent countless hours on his own as a young boy learning how to fish while his parents worked. The river was a couple of blocks from his home and the more fish he caught, the more inspired he became to learn more. It was when his parents rented a cottage that he caught his first musky and he was introduced to Ranger Rick and his seminars, which he attended all of them to learn how to become a better angler. Aaron enjoyed the rush of catching the musky and decided to join Muskies Inc and won several tournaments with first place. Aaron's advice for anyone thinking of fishing is "follow your dream to the very last day, achieving or trying your best leads to happiness and happiness opens the door to anything that is possible". I've been using the Rod Gloves when I travel and I have been using the Rod Wrapz to bundle and carry my rods. As a co-angler, this is ideal. I love the Rod Gloves as they are easy to use and protect everything when I am travelling from Minnesota as well.